Colin Green Photography: 1 Aspinall Street, Mytholmroyd.. Birthplace of Poet Laureate Ted Hughes. 1 Aspinall Street, Mytholmroyd.. 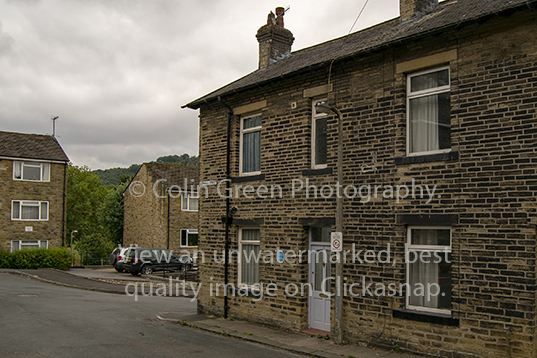 Birthplace of Poet Laureate Ted Hughes. 1 Aspinall Street is a small terraced house in Mytholmroyd, West Yorkshire that is known for being the birthplace of Poet Laureate Ted Hughes. Born on August 17th 1930 Hughes lived in the house until he was 8 years old before moving to Mexborough, South Yorkshire. The period spent living in the house and the area around Mytholmroyd is said to have influenced many of Hughes poems. 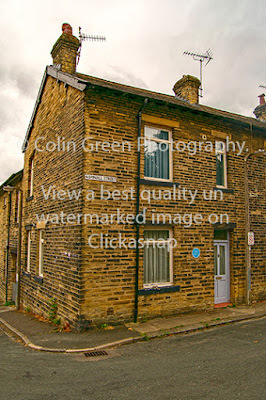 The house is now owned by Calderdale Council and leased to the Elmet Trust. The Elmet Trust was established in 2006 to promote the works and life of Ted Hughes, they leased the house and in June 2008 restored it to a 1930's look. It is now available as a retreat and holiday home for writers. Discover more about the Elmet Trust here. These pictures were taken on July 21st 2018 using a Nikon d3300 SLR camera. There are only 2 pictures with the colour versions available best quality on Clickasnap. The poem featured over the picture is The Harvest Moon by Ted Hughes. The copyright of the poem belongs to the relevant rights holder. The following 2 pictures are taken from the Flickr album which are black and white, the colour ones can only be seen beat quality un-watermarked on Clickasnap. Click the link underneath the pictures to view on Clickasnap. View or download on Clickasnap here. Click on any to be taken to the homepage, all links open in another window.